Then he got out of the car and started coming toward me. Remember we are at a stop light at the bottom of a highway off ramp. There’s nothing around. Thank god there were construction workers there. He apparently forgot to set the brake on the car and it started rolling into the intersection. Another car almost hit it. He ran and got back in the car to stop it. Some construction workers started over to see what was going on. He drove away at high speed. I have his license plate number. I called another Uber because I didn’t know what else to do. Two of the construction workers waited with me. The second Uber driver was lovely. I didn’t call the police yet because I didn’t have time. I would have missed my flight. I think it probably goes without saying that I am uncomfortable with this person having my home address, which is where he picked me up. I’d like to know what you’re going to do about this. Finally, when I look at my driver history, this person did not look like the picture in his profile. He didn’t get out of the car when he picked me up so I didn’t get the best look at his face, but when he got out of the car at the end it didn’t look like the same guy. 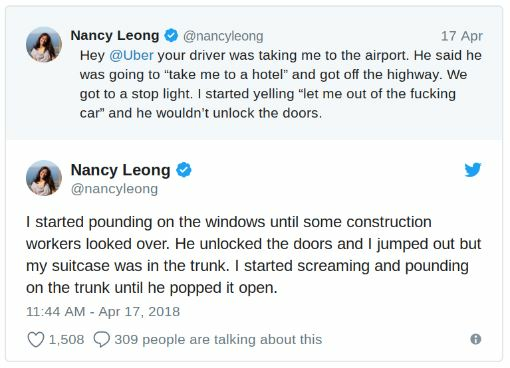 Hey @Uber I really need you to understand how terrifying this was. I was about 10 seconds from putting my foot through the back passenger window. I’m getting on a flight but I expect a response ASAP. Next Post: What He Found In this Abandoned Nursing Home Is Amazing. I’d Never Expect It There.